In Advent the streets and squares of the UNESCO World Heritage site and one of Germany's best preserved medieval cities are filled with sparkling Christmas lights. 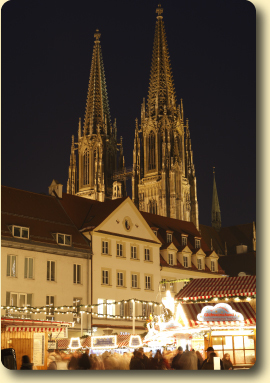 The castle-like towers of the mansions built by medieval patricians look magical in the shimmering atmosphere, as does the Regensburg’s Christmas Market, which an independent jury described as one of the loveliest in any German-speaking country. 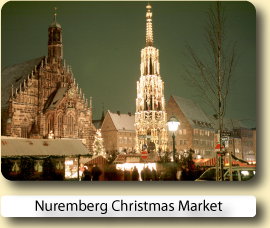 The stalls and booths around the 500-year-old Neupfarr Church and in front of the classical columns of the former city guardhouse sell a glittering range of Christmas decorations, traditional Nativity crib scenes with carved figures, children’s toys and other very practical presents. Through narrow streets, hidden passageways and courtyards, the visitor can stroll on to Kohlenmarkt and Haidplatz, to LUCREZIAMARKT where artists and craftsmen set up stalls laden with wonderful handmade wares such as dolls, pottery, paintings on silk and other materials, marionettes hanging amid a mass of strings, fine-quality toys (often too good to play with) and all sorts of other gifts. The creative people who have made all these objects are happy to explain techniques, and to encourage visitors to make tings themselves. Alongside these stands with their works of art, other booths invite visitors to sample gingerbread and Christmas cookies, all baked, of course, with wholemeal flour and other mouth watering goodies . 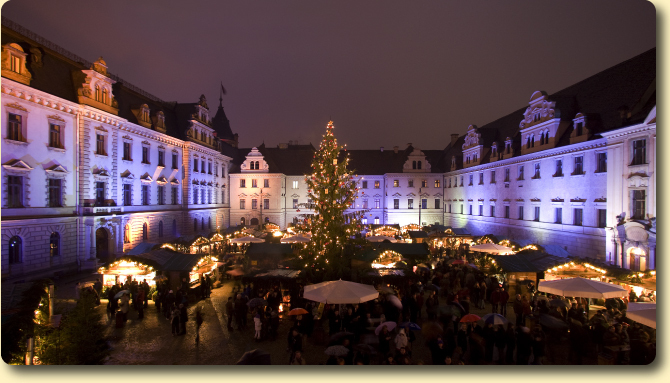 Furthermore, located in the courtyard of Thurn and Taxis Palace there is the Romantic Christmas Market, a Christmas event like a fairy tale. 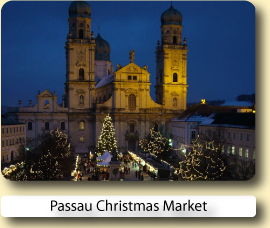 This romantic Christmas market offers all the bustling atmosphere of a market, traditional Bavarian delicacies, and a varied programme of cultural events like daily entertainment programmes with theme nights, for example “The Night of Choirs”, “Bavarian Style Christmas” and so on. Her Highness Gloria of Thurn und Taxis tells the “Christmas Story” and Regensburg’s “Christkindl” recites poems each day. 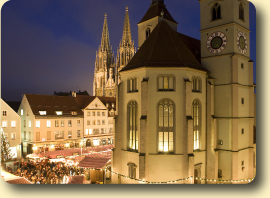 At the Spitalgarden, Regensburg's fourth Christmas Market takes place in front of some fantastic scenery, overlooking the cathedral and the old stone bridge. With its advent enchantment guests can experience an extraordinary programme with regional dishes and specialities like mulled wine, or mulled beer, wild ragout and much more. And every year again during Advent there are boat trips along the Danube Valley from Regensburg through the charming winter landscape. These boat trips take place every Friday, Saturday and Sunday at 7pm during the pre-Christmas period. Plus don’t miss the Christmas concert of the world famous boys choir, the “Regensburger Domspatzen”. Germany's Medieval Miracle - Regensburg`s remarkable buildings and towers offer an unspoiled look into the past; the wars of the 19th and 20th centuries left this Danubian community virtually unscathed. just tourist attractions; some are still functional to this day. The Stone Bridge, for example, built on 16 huge arches in 1146, has been in continuous use for more than 800 years. Regensburg is a city of churches. Focal points of early Christianity, its ecclesiastical buildings are majestic and typify early Christian architecture. Most famous is St. Peter's Cathedral, inspired by the French Gothic style and built in the 13th century. One of the most impressive remnants of Roman occupation in Regensburg is the Porta Praetoria behind the cathedral. Commerce in Regensburg is as old as the town itself. During the Middle Ages the city grew large and famous through the wealth of its merchants. It is still a merchants' town with its modern shopping centres and high quality wares. 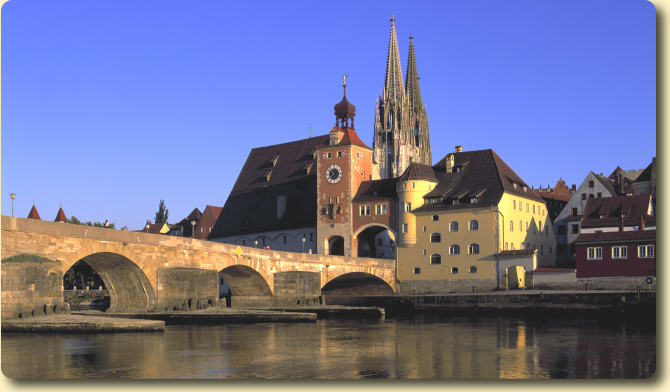 Throughout the ages Regensburg's hospitality has been extolled - early documentation comes from a letter Mozart wrote to his family praising the city's fine food and wine. The youthful composer may have visited the ancient Wurstküche (sausage kitchen), one of Germany's oldest kitchen near the Stone Bridge. Its not common that a reason to go to an amazing city is a hotel, but the Orphee is one of those rare hotels that makes the trip worthwhile. This is a very good hotel, centrally placed across from the Cathedral, with parking. The rooms are spacious and well-appointed, with modern bathrooms. The staff are particularly pleasant and helpful. Friendly and helpful staff throughout the hotel. Brilliant breakfast that kept you going throughout the day. Just around the corner from the Bahnhof and 10 minutes to the Altstadt. 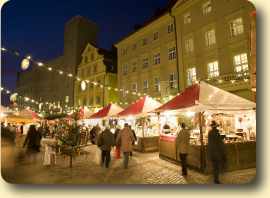 Book your hotel for the Regensburg Christmas Market with Expedia or Hotels.com.Both online reservation services will let you compare and book hotels at great low prices.